Ranting Panda: Nothing smashes people smuggling like paying people smugglers. Nothing smashes people smuggling like paying people smugglers. Nothing smashes a people smuggling model like paying people smugglers. 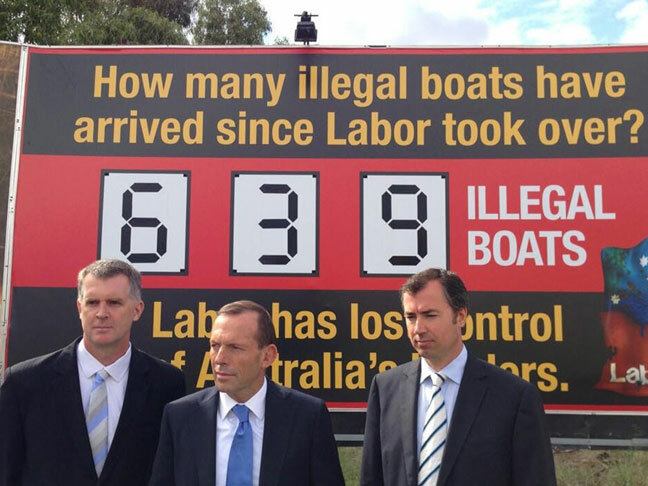 Remember when the LNP claimed they would stop the boats by smashing the people smuggling model? Since then there have been boat turn-backs and it appears as though very few boats have reached Australia. However, when quizzed about anything to do with turn-backs, arrivals or tactics being used, the LNP pull up the shutters and state that they can't discuss operational matters. When they were in opposition, the LNP published these 'operational matters' on bill-boards (1) and even told the so-called people smugglers that under Labor, Australia had rolled out the 'Rudd-carpet' for asylum seekers to make the perilous journey by boat from Indonesia(2) (3). Come one, come all. Opposition Leader Tony Abbott keeping 'operational matters' a national secret. This week, Prime Minister Abbott refused to rule out whether Australia has paid people smugglers $5,000 each to return asylum seekers to Indonesia (5). Surely a simple 'No' would not breach operational secrecy, particularly considering that Indonesia is now a little miffed and has demanded answers of the Australian ambassador (6). If true, Australia is possibly breaching international law (yet again) by employing people smugglers. I wonder if the people smugglers enjoy a Comsuper scheme. But I digress. Australia has breached numerous international laws in their effort to secure votes through the demonisation of asylum seekers. Australia has refouled asylum seekers to countries where they face torture and persecution. The treatment of asylum seekers breaches our obligations under the UN Refugee Convention and also breaches the UN Convention on Torture (7). And while we're at it, why not give a couple of Naval vessels to Sri Lanka to round up any Tamils who may try to flee the human rights abuses and war crimes of the Sri Lankan government (8). The rule of law and human rights obligations mean nothing to this government, so with this level of moral turpitude, why not chuck people smuggling in there. While the government is benefiting from the votes gained from xenophobia, who cares how many lives are destroyed. But at least asylum seekers are not drowning at sea, so the LNP ministers and hacks repeat ad nauseum. Well ... at least their not drowning in OUR sea. But as we've seen recently with hundreds of stateless Rohingya fleeing Burma, there are people risking their lives to flee persecution. There have been hundreds of refugees drowned trying to reach Europe from Africa. Perhaps some of these had opted for Europe instead of Australia because of the stop the boats policy. The Abbott-led LNP government has shown that it has no interest in helping the world's most vulnerable. Instead it has shown itself to be a morally bankrupt government that is only interested in popularity which is an easy win when feeding fear, racism and xenophobia to the general population. The LNP's economic achievements are sadly lacking, so they compensate through turning the population on itself. Spreading dissent and fear. They failed to pass many of their unfair policies in the 2014/15 budget which were attacks on the low-paid and poor while protecting the rich. They continue attacking workers rights, attacking unions such as through their royal commission into union corruption while ignoring the corrupt 'phoenix' companies who screw workers out of their hard-earned by declaring bankruptcy and then restarting without paying workers what they're owed. Demonising the poor, demonising unions, attacking workers. The LNP's scare-mongering is aimed at distracting from these attacks on workers and the poor. It's aimed to create fears based on falsehoods about asylum seekers, terrorism and Islam. It's a narrative that is full of hyperbole, hypocrisy and lies. Rather than persecuting the persecuted by using asylum seekers as pawns for political popularity, why not attack the source. If the LNP is truly concerned about the 'evil' trade of people smugglers, then why not increase penalties for people smuggling and give significant jail time to those who sail the boats into Australia. Most of these so-called people smugglers are Indonesian fisherman trying to make a living. It wouldn't take long for them to refuse to engage in 'people smuggling' if they faced several years in an Australian jail, unable to make a living for their families. This way any asylum seeker arriving by boat could be processed humanely and in accordance with the UN Refugee Convention and not used as a scapegoat for political posturing, while those sailing the boats are jailed. While demand for 'people smugglers' may not be reduced, the supply of people smugglers certainly would be. Yet, instead of actually addressing the problem, the LNP has taken a sledge-hammer approach the punishes the innocent, destroys their lives, all in the name of politics. The LNP waxes lyrical on the evil of people smuggling, yet by Abbott's own admission, he is willing to engage in any activity, 'by hook or by crook' to stop the boats ... and win the votes. 1. The Hoopla, Tracey Spicer, 'They. Are. Not. Illegal', 25 April 2013, http://thehoopla.com.au/illegal. Accessed 13 June 2015. 3. The Australian, Scott Morrison, 'PM is the people-smugglers' best friend', 2 July 2013, http://www.theaustralian.com.au/national-affairs/opinion/pm-is-the-people-smugglers-best-friend/story-e6frgd0x-1226672793802. Accessed 13 June 2015. 4. SBS, Helen Davidson, 'Analysis: 'Illegals' and the erosion of empathy', 26 August 2013, http://www.sbs.com.au/news/article/2013/04/30/analysis-illegals-and-erosion-empathy. Accessed 15 June 2015. 5. Jakarta Globe, Matt Siegel, 'Pressure mounting Over People-smuggling Payment Reports', 12 June 2015, http://thejakartaglobe.beritasatu.com/news/pressure-mounting-australian-people-smuggler-payment-reports. Accessed 13 June 2015. 6. Sydney Morning Herald, 'Indonesia seeks answers from ambassador over people smuggler cash claims', 13 June 2015, http://www.smh.com.au/federal-politics/political-news/indonesia-seeks-answers-from-ambassador-over-people-smuggler-cash-claims-20150613-ghn9rk.html. Accessed 13 June 2015. 7. The Age, Lisa Cox, 'Tony Abbott: Australians 'sick of being lectured to' by the United Nations, after report finds anti-torture breach', 9 March 2015, http://www.theage.com.au/federal-politics/political-news/tony-abbott-australians-sick-of-being-lectured-to-by-united-nations-after-report-finds-antitorture-breach-20150309-13z3j0.html. Accessed 9 March 2015. 8. 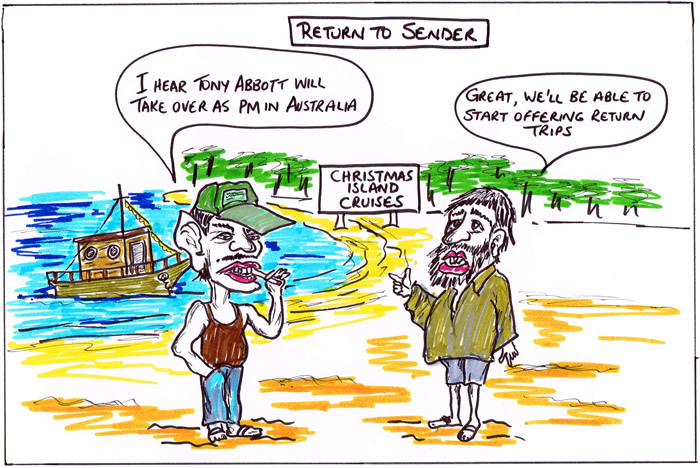 Sydney Morning Herald, Ben Doherty, 'Tony Abbott's boats gift to Sri Lanka comes under fire', 18 November 2013, http://www.smh.com.au/federal-politics/political-news/tony-abbotts-boats-gift-to-sri-lanka-comes-under-fire-20131117-2xp5z.html. Accessed 13 June 2015. Whose side is Tony Abbott on?